For comic, movie and sneaker aficionados, the Forum Mids represent the best of all three worlds. 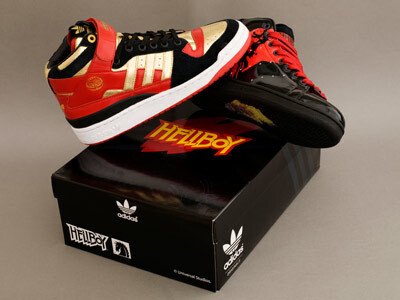 The shoe comes in a specially designed package boasting a trio of gold, black, and white with the Hellboy lettering across its Velcro strap. On the shoe's outsole and footbed is the image of Ron Perlman, the titular demonic anti-hero of the movie. Watch out for a possible onscreen appearance of this shoe! Completing the pair of these special edition shoes is the Stan Smith Mid which comes in a black patent leather with the bestselling ‘pimple' soled silhouette. An exclusive image of Hellboy from Mike Mignola himself- legendary writer of the Dark Horse comic book where Hellboy was based from- retains the aesthetic feel of both film and publication. Extra details on the inner and outer sole, like a collection of three extra footbeds, plus lace jewels, a mini-comic and unique tongue branding, finished with a box created exclusively for this three-way collaboration make for a very special release. The Forum Mid and Stan Smith Mid shoes will be available only at the adidas Originals Concept Store in Trinoma this September in very limited numbers. Catch them and unleash the Hellboy-fan in you!